S.V. Snel&Lenig - De website van sportvereniging Snel&Lenig! Sportvereniging Snel & Lenig Wassenaar is een sportvereniging die sinds 1946 sportlessen verzorgt. Met een aantal van 400-leden, behoort deze vereniging tot één van de grotere verenigingen van Wassenaar. Snel&Lenig biedt veel verschillende sporten zoals: Judo, Karate, Streetdance, Klassiek Ballet, Turnen, Kleutersport. Klik hier voor ons lesrooster. Wilt u 1 van onze sporten proberen, geef u dan op voor een proefles via het formulier te vinden op de pagina "proefles / try-outs". Would you like to try-out one of our sports, please registrate for a try-out class by filling in our form on the page "proefles / try-outs". Jij komt toch ook naar 'The Greatest Show' van de Turnafdeling van S.V. Snel&Lenig? Zondag 14 april 2019, van 14.45-16.30 in Sporthal de Schulpwei. De Algemene Leden Vergadering begint om 20:00 uur, jij komt toch ook? Als je vragen of agenda punten hebt mail de secretaris. In short, resisting a more powerful opponent will result in your defeat, whilst adjusting to and evading your opponent's attack will cause him to lose his balance, his power will be reduced, and you will defeat him. This can apply whatever the relative values of power, thus making it possible for weaker opponents to beat significantly stronger ones. This is the theory of ju yoku go o seisu. There are three basic categories of waza (techniques) in judo: nage-waza (throwing techniques), katame-waza (grappling techniques) and atemi-waza striking techniques). Judo is most known for nage-waza and katame-waza. Judo practitioners typically devote a portion of each practice session to ukemi (break-falls), in order that nage-waza can be practiced without significant risk of injury. When young learned it helps you in normal life too, especially when you are getting older. This is proven. More and more we are sitting, the new illness. Children are not playing on the streets anymore. With sport, any sport, children are challenged to grow, to get more self-confidence and independency. However, many doctors are promoting judo. Why? It is fun, it is very helpful for the locomotion and it has some basic principles of life. Who doesn’t want to romp with their older brother, parents or even grandparents. You are training many muscle groups. Besides these locomotion Judo has many basic principles of life, e.g. : safety, respect, discipline, trust, cooperation, responsibility and emotion. When you are throwing someone he has to trust you. You are responsible for his safety. You do it together. 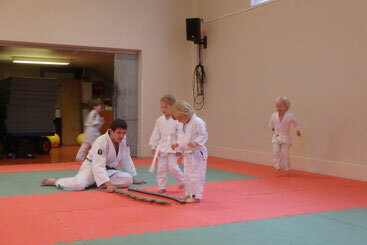 Like other sports Judo there are some rules, the do’s and don’ts, to ensure the fun and safety.